The pack out process is when contents are removed from the interior of the claim site. Our Pack out process is when DCMG removes contents from the interior of the claim site. The reason to pack out contents is to limit any further affect or damage to the contents within the claim site. It also eliminates the risk of contents being damaged during the structural restoration process. 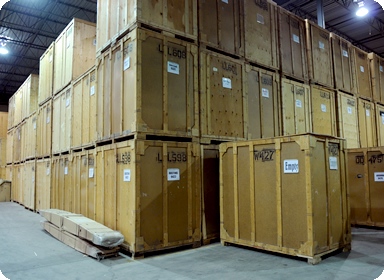 All contents are photographed, documented, and packaged to ensure safe transport to the nearest storage facility. All items are labeled and identified by their location within the claim site so our professional team will be able to return them to their proper positions once the structure has been resorted. Natural disasters can cause situations that require home and business content removal and relocation for timely and comprehensive cleaning and restoration. It is generally easier, more secure, and cost-efficient to take certain contents to another location for restoration work. After content cleaning and restoration, items are returned to the home or business using the same inventory procedures and documentation employed in the pack out process. Your items are loaded, transported and delivered with care and checked with the original inventory documents. A pack in, or pack–back, is when our contractor returns all contents back , cleaned to their original position at the home. Our team reviews all photographs from the pack out and place the contents back into their original positions. Unless the homeowner/business owner specifies otherwise. During your claim it will be clear that some contents have been damaged beyond a salvageable point and will not benefit from our restoration process. All of these items will be documents on a Non-Salvageable List and their photos will be taken. The Non Salvageable List allows the client to see a consolidated list of items that were definitively lost as well as providing this list to the insurance carrier for reimbursement. DCMG clients can rest assured that their contents are being kept safe and sound while the property restoration process is being completed.